Rolls-Royce is in a peculiar position when it comes to imagining the future of luxury transportation. The 112-year-old motor company is the very definition of a luxury car, but much of its auspicious reputation is based on its embodiment of classical luxury, in the tradition of Beethoven, foie gras, and delectable suicide doors. But Rolls-Royce customers expect the best, and as the brand focuses on wooing a younger customer base, tasteful, top-of-the-line technology is becoming paramount to those expectations. The look, tactile feel, and the user experience of that technology fall on its design department to imagine. Giles Taylor is charged with striking that careful balance as design director of Rolls-Royce. His most contemporary response is the brand’s flagship model, the Rolls-Royce Phantom, officially unveiled today in the UK. It is the eighth Phantom model to be produced in the history of the company. The new Phantom is anything but unemotional. Sweeping curves disguise a myriad of sensors, including a touch-sensitive one on the door for valets to use at great affect. A new feature the brand calls “The Gallery” toys with the screen art of the car, featuring the work of commissioned artists as a backdrop option that spans across the dash. The instrument panel is digitized against a 12.3-inch TFT display. Rolls-Royce markets it as “the most technologically advanced Rolls-Royce ever.” The clock, however, is analogue. While the Phantom was revealed publicly today, I first saw it in its aluminum spaceframe flesh at a private viewing for select customers and media in New York City in June. We were ushered into a dimly lit Chelsea studio, where — in a dramatic flourish — the car was revealed on a rotating stage, as if we were watching a production of theater in the round. 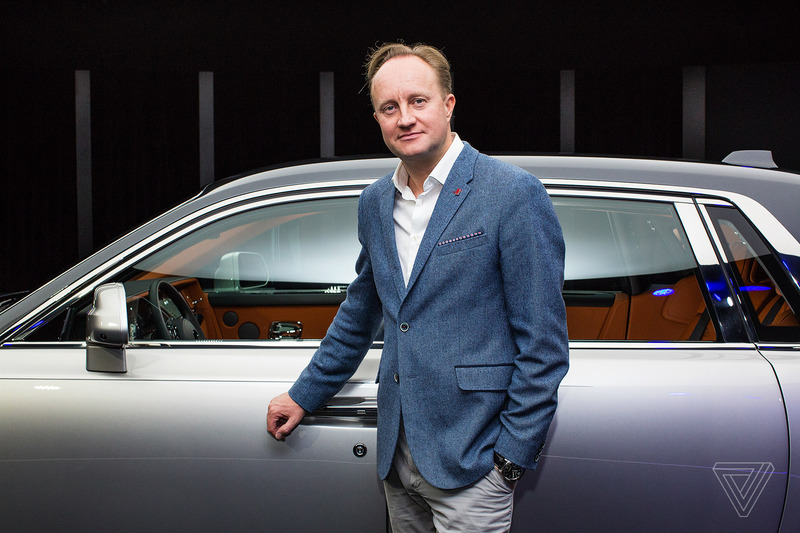 Both Taylor and Rolls-Royce CEO Torsten Müller-Ötvös were there to present the car and describe its nuances. Pageantry is essential to the presentation of a new Rolls-Royce. The brand, owned by parent company BMW, makes every effort to distinguish itself as a distinctly unforgettable British, super luxury carmaker. Phantom, first introduced in 1925, is the brand’s halo vehicle. Its contemporary form is an indicator of the direction Rolls-Royce vehicles will move into during the coming years. It’s also the most expensive vehicle in the lineup. The current Phantom starts at $417,825, so the Rolls-Royce flagship literally needs to look like money. The most obvious aspects of this luxuriant design are its grand proportions that taper neatly into sculptural form. It’s a massive vehicle, lighter than its predecessor, but it still weighs in at 5,862 pounds, due to the use of lighter-weight materials like li aluminum. But it’s far from stodgy. “When it comes to Phantom. I would like to contemporize the perception of the vehicles, so that [customers] can feel like they can drive the car. The car itself has a level of athleticism. The car has capable handling,” Taylor said. Though it is grand in proportion, its hefty V12 engine races from 0–60 in 5.3 seconds and produces 563 horsepower. Taylor cites an F16 jet as one inspiration for his vision. Taylor attended the Royal College of Art and has previously designed for Citroen and Jaguar. For him, designing a vehicle form truly begins with the hand-drawn line. “I always believe the line comes first and the surfacing comes later. The surfaces can develop from it, but if only if the boundaries are right. That comes back to designers holding pens, whether its electric or old-fashioned pen and paper.” Taylor uses a pencil and sketches almost daily. But he is invigorated by the possibilities that new technology opens up to car designers in big picture ways. 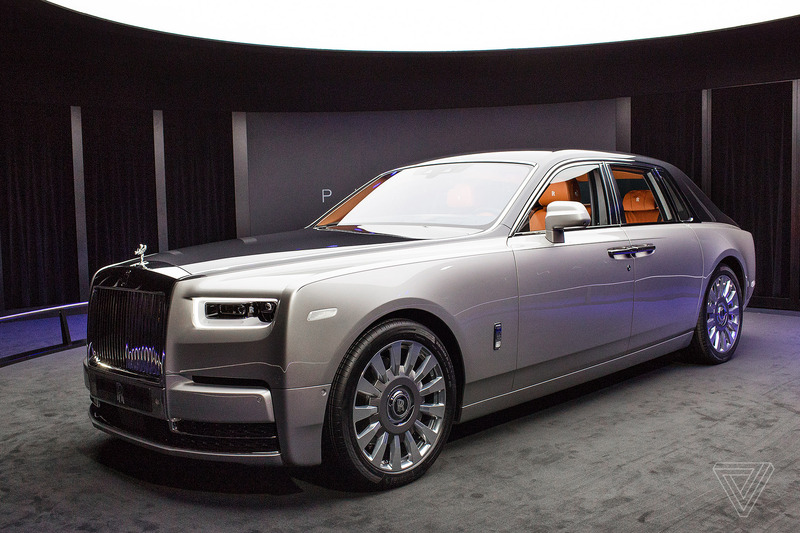 Last year, Rolls-Royce showed off the wild 103EX concept car, and a few slick cues have trickled into Phantom’s form both in the exterior and interior. It’s safe to say that Phantom is laying the foundation for what that new era looks like. Taylor offers a clue at where he and his team are looking — such as Formula E racing series. How this translates into the modern-day eighth generation Phantom is alluded to in design elements such as the shape of the grille, which is presented flush to the car. “We wanted to start to get the grille as an expression of the car rather than a standalone piece, Taylor said. “Does it really need to be there to hide a combustion engine? Finally, the aesthetics can start to grapple with that new sense of freedom.” In a company that grapples with maintaining its classic identity, these structural changes are not made lightly.